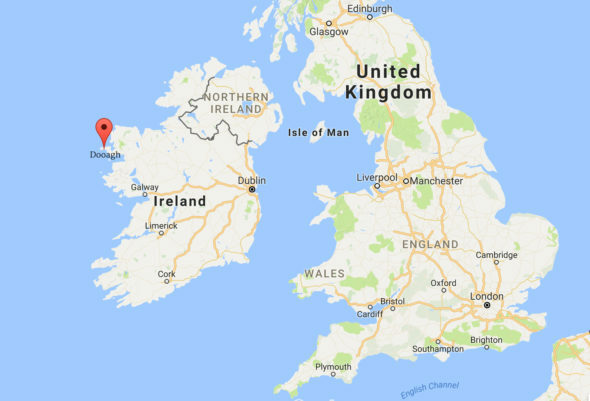 (by Henry McDonald, The Guardian, May 8, 2017) – An Irish beach that disappeared more than 30 years ago has returned to an island off the County Mayo coast. The sand at Dooagh, Achill Island, was washed away by storms in 1984, leaving only rocks and rock pools. 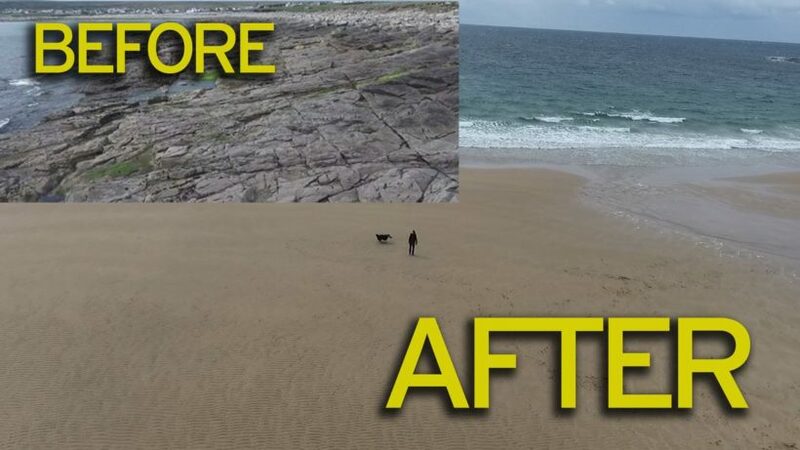 But after a freak tide around Easter this year, hundreds of tons of sand were deposited around the area where the beach once stood, recreating the old 300-metre stretch of golden sand. 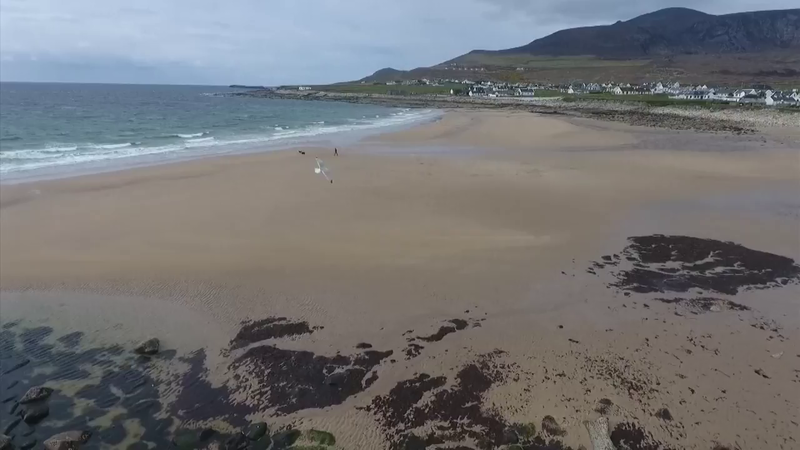 Sean Molloy, manager at Achill Tourism, said local people were delighted to have the beach back. Recalling the events of 1984, he said: “Some big storms destroyed the beach. It was completely washed away and 1984 was the last time the beach was there. Alan Gielty, who runs a local restaurant, said the reformed beach was attracting a new influx of tourists. Achill is a remote, rugged and unspoiled island in the west of Ireland. Its most famous inhabitant was Heinrich Böll, the German anti-Nazi Nobel prize-winning writer, who lived there in the 1950s and 60s. His former cottage has been transformed into a retreat for writers. 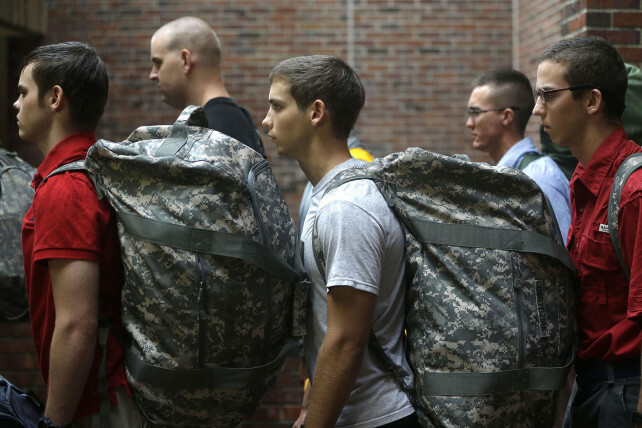 (from Associated Press, May 10, 2017) WEST POINT, N.Y. — Brothers Noah, Sumner and Cole Ogrydziak entered West Point’s grueling world of 6:30 a.m. reveille, 60-pound packs and rigorous course loads on the same day four years ago. The three cadets are now preparing to fling their caps together at graduation this month, marking a rare fraternal trifecta at this storied academy. Twin Cadets Cole Ogrydziak, left, and Sumner Ogrydziak, right, and younger brother Cadet Noah Ogrydziak, pose for a photo at the U.S. Military Academy, at West Point, N.Y. The band of brothers from Nederland, Texas, will graduate with the U.S. Military Academy’s Class of 2017 on May 27. The first duty stations for the future Army officers are still being worked out, but it’s clear to the brothers that their years of being just a short march from one another are numbered. Cole and Sumner are 21-year-old twins. They are not identical but share the steady posture, close-cropped hair and old-school courtesy common among cadets. Older brother Noah just turned 23 and spent a year at West Point’s prep school before entering the academy along with the twins on July 1, 2013. Cole compares their West Point experience to having “automatic friends.” They got used to snowy northeastern winters together, learned how to stand in formation and maneuver in the field. They share the nickname “O.G.,” which is [short for] Ogrydziak (pronounced oh-GREE’-zee-ak). But the Ogrydziaks are in different regiments and take different classes. They are three in a sea of 4,400 gray-clad cadets walking briskly among the imposing stone buildings here. Brotherly connections come when Cole asks Noah for help with a computer course or they share a pizza on the weekend. Cadet candidates, front row from left, Cole Ogrydziak, his twin Sumner and their brother Noah, of Nederland, Texas, line up during Reception Day at the U.S. Military Academy at West Point, in West Point, N.Y. in 2013. “Every so often I’ll see them during the day. But we’ll try to eat dinner at nights together, and especially on weekends we’ll get together and watch a movie. That’s always pretty fun,” Noah said. The last time three siblings graduated West Point together was 1985, when twins Rose and Anne Forrester became officers at the same time as their older brother, John. It’s not clear how many other times three siblings have graduated together since the academy was established in 1802. 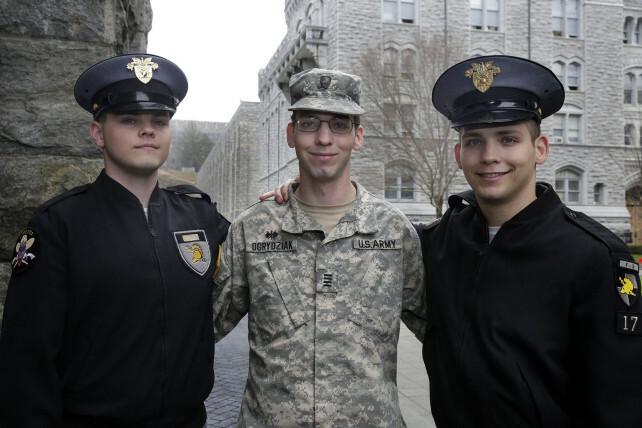 Less rare are cases in which three siblings simply attend West Point at the same time. The graduating class this year also includes Arianna Efaw, the third of three sisters from Denver to graduate here since 2014. The three sisters overlapped here for a year. Sumner’s assigned Army branch is engineers, and he’s headed to South Korea. Cole is headed to a medical school to become a doctor and Noah will be in Signal Corps, and they do not yet know their destinations. But it’s likely they will be scattered around the globe for at least the next several years. West Point has lost about 100 graduates in the war on terror since Sept. 11, 2001. Some of those deaths were announced in the cadet mess hall since the Ogrydziaks became cadets. The brothers, who are from a military family, shrug off questions about potential dangers ahead. Their mother, Kristine, served in the Coast Guard for 10 years, and their father, Randal, is a Coast Guard captain who is retiring next month after 38 years of service. The oldest Ogrydziak brother, 26-year-old Vaughn, is a chemical engineer in the private sector. 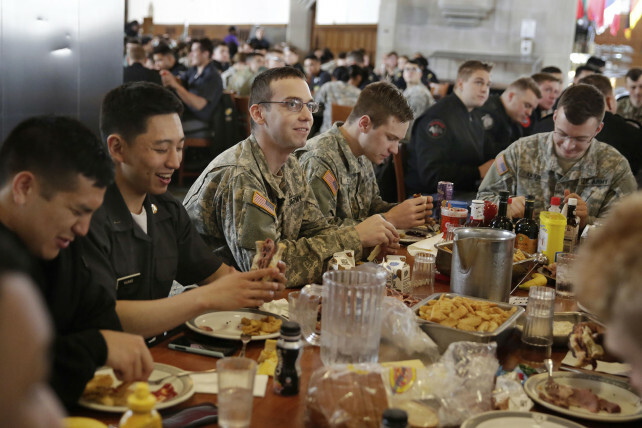 Noah Ogrydziak, third left, joins fellow cadets at lunch at the U.S Military Academy, at West Point, N.Y on April 21st. Back in Nederland, the parents are full of pride for their youngest sons but understand the dangers. Randal is retiring in June, but not before performing one more heartfelt duty. After graduation, the family will gather somewhere on West Point for the traditional “pinning ceremony.” Randal will exercise his privilege as a commissioned officer to personally give his sons their oaths. The parents will place second lieutenant bars on each of their boys’ shoulders.